You know what I miss when trying out a paleo or low carb diet? Not bread. Not mashed potatoes. Not chips. Not crackers. Not cheese. I miss the CRUNCH. I like carrots and crunchy stuff like that, but I MISS THE CRUNCHY SNACKS. And I’m NOT eating them, but I still want to crunch things. I bought nuts to snack on, but they are, meh, sort of crunchy and sort of not what I’m looking for in a snack. 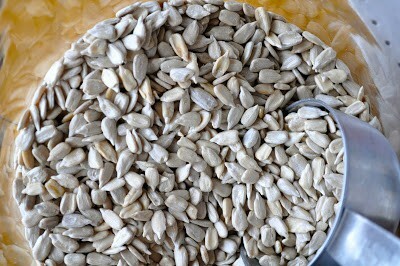 Then I happened upon the best low carb or paleo snack, by roasting sunflower seeds at home! One day I made popcorn in the stovetop popper for my kids the other day. For my snack, I helped myself to a handful of sunflower seeds, raw un-roasted and again they were meh. Ok but not the best. I bought the raw ones because they are 3 dollars a pound less than roasted, but I was kicking myself for not getting roasted. After I ate a few seeds and was unsatisfied, I turned to the popper and tossed them in. It was still hot, and in a few minutes, they were warmed and crunchy. I was entirely on to something. Paleo Snack for the win! Over the next few days I messed around, and finally, I think I have roasting sunflower seeds at home for a paleo snack down pretty good. You’ll need the stove top popper like mine to make this work. Well, you can do them in the oven but they require heating the whole oven to make a quick snack, and they burn fast. I bought the raw seeds for their low price. I don’t want to counteract that by spending a couple of bucks to roast them. YOU could though. 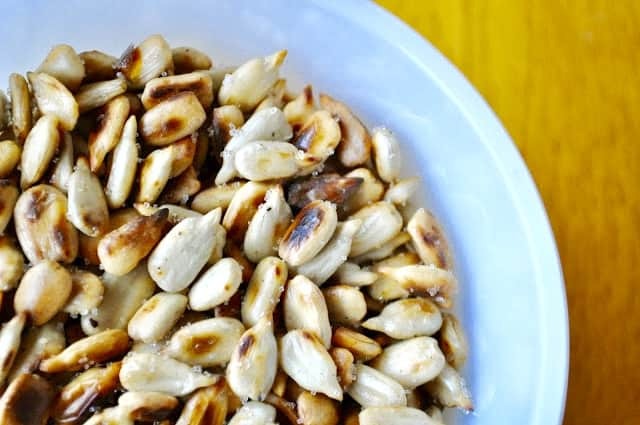 Roasting Sunflower Seeds is a fun way to make a quick snack at home. Plus they're low carb and paleo so you can be happy and healthy with this snack! Anyway, if the cost of buying less processed foods has got you down these are some seriously cheap Paleo eats. Everyone in my house loves them and they’ve since become the favorite treat even over popcorn. You are so damn clever! That is serious innovation! Wow..these look awesome. Will definitely need to give this a try!